A few months ago, somebody asked me how I create the "lights and shine" in my paintings. I took it to mean the golden lighting and how I used it to illuminate the subjects in my paintings. So, I made a video demo to walk you through the way I create the intense, luminous backlighting effect. I'm a newbie at making videos so after a lot of struggling and frustration with Windows Movie Maker and after that, Adobe Premiere Pro, I finally did it! I like it a lot! It really does look like she's in late day sun. 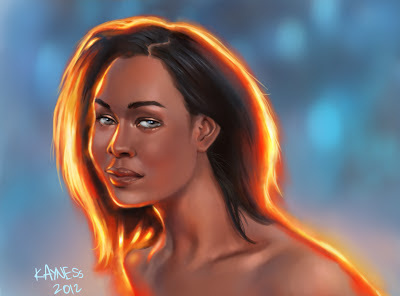 Backlit... it looks like fire in her hair.